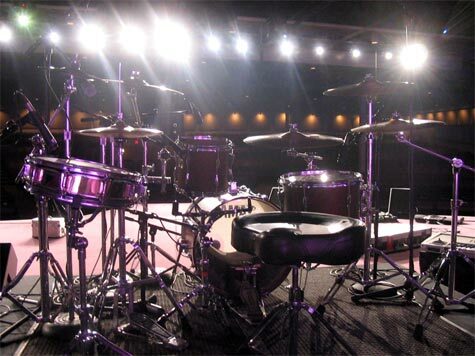 these are some pics of my drums a concert about 2 months ago, Yamaha Stage Custom, Dw Hardware including pedals, all zildjian cymbals, 14'' quickbeat hats, 19" A Custom crash, 20" K custom dark ride, 18" K custom dark crash, 16" K dark crash, and a 10" A custom splash. 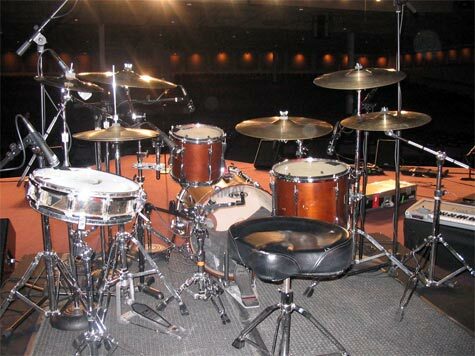 The snares that I have are two snares that I got from Ricky Lawson, the green snare was used on the Steely Dan tour. the other is just one from his collection.